About 60 first-graders from Hickam Elementary School enjoyed a field trip yesterday to the Children's Discovery Center in Kakaako. 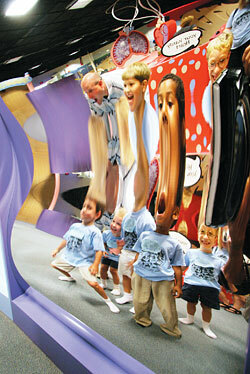 Braden Holty, left, Jaxon Andersson, Ryan Dague, Isaiah Leos-Coleman and Timmy Giaconia had fun looking at themselves in distortion mirrors. 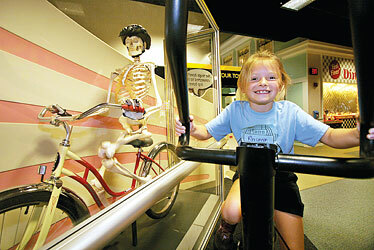 Rhiannon Jarvis pedaled as fast as she could to demonstrate how the skeleton works during a class trip yesterday to the Children's Discovery Center. First-grade teacher Lee Skoda, above, had her pulse checked by two of her students, Elizabeth Graham, right, and Erica Marshall. Ryan Dague, below, made good use of the slide.